Major security plans have been put into action ahead of Israeli Prime Minister Benjamin Netanyahu’s UK visit amid fears of protests over his record on Gaza and the treatment of Palestinians. A major demonstration has been planned by the Palestine Solidarity Campaign (PSC) to take place on Wednesday at Downing Street, where Netanyahu is due to meet Prime Minister David Cameron. A statement on the PSC website says: “Netanyahu bears direct responsibility for the war crimes identified by the UN Human Rights Council following Israel’s brutal assault on Gaza last summer. More than 2,000 Palestinian men, women and children were killed by Israeli forces during that 50-day massacre, and much of Gaza was destroyed. “And yet the British Prime Minister will shake Netanyahu’s hand next Wednesday and doubtless discuss, among other things, more arms deals between the UK and Israel,” it adds. An online petition to have Netanyahu arrested for his involvement in the 2014 Gaza war has now reached over 100,000 signatures. The petition’s founder Damian Moran told the Anadolu agency: “I never really understood the Palestine conflict until about 10 years ago when I did some actual research on it and was horrified by what I found. I could empathize greatly with Palestinians with all the horrors they faced. 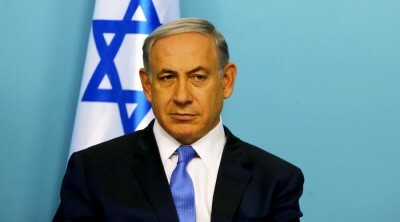 The British government has said it will not arrest Netanyahu because “under UK and international law, certain holders of high-ranking office in a state, including heads of state, heads of government and ministers for foreign affairs are entitled to immunity, which includes inviolability and complete immunity from criminal jurisdiction. Conservative MP Eric Pickles also joined the debate, saying that he welcomed “the government’s unambiguous response, which reiterates its support for Israel’s right to self-defense and condemnation of Hamas’s terrorist tactics. The petition will have no impact upon the UK-Israel relationship which is stronger than ever and Prime Minister Netanyahu’s forthcoming visit will enhance it further.